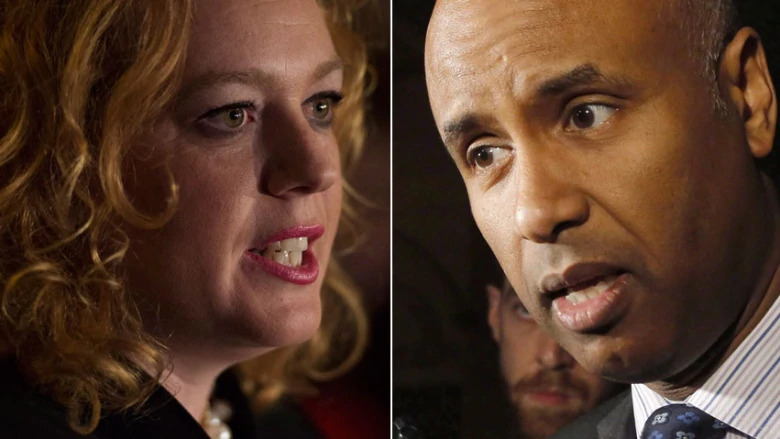 Ontario’s minister responsible for immigration has demanded an apology from federal Immigration Minister Ahmed Hussen for saying the province is promoting fear about asylum seekers. “Maybe the minister should sit down and have a nice cup of tea, calm down a little bit and maybe phone me and apologize for calling me unCanadian,” Lisa MacLeod said Friday. Ford has said the federal government is ushering people across the border and asylum seekers, whom he calls “illegal border crossers,” have caused a housing crisis in Ontario. Hussen said the new premier’s messaging is irresponsible. “It’s divisive. It’s fear-mongering and it’s not Canadian. It’s very dangerous,” Hussen said. Earlier in the day, MacLeod walked out of the meeting after a testy exchange with the minister. She did not sign onto the meeting’s communique. Jeremy Harrison, Saskatchewan’s minister responsible for immigration, also refused to sign. In a statement, Harrison said the government of Saskatchewan expects Ottawa to handle the bill for asylum seekers. Ontario would still like to work in partnership with the federal government, MacLeod said, but she said the province’s concerns aren’t being heard.